Love that it is so close to the presidental palace. Also it was awesome to rent some bikes and bike along Corniche Rd. Staff were amazing. Gym was great. Valet parking was free. The beach was ok, but the view isn't ideal (felt more like a lake) but it's not really the hotels fault and just the result of too much drudgung. 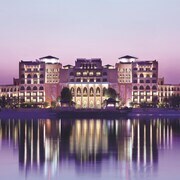 Visit the bustling city of Abu Dhabi and discover the riches the capital of the United Arab Emirates has to offer. 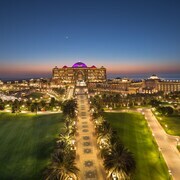 Admire the Sheikh Zayed Grand Mosque and Emirates Palace for their opulent Arabian architecture. Spend an exhilarating day at Ferrari World, Yas Waterworld or Hili Fun City theme parks. Heritage Village is a great place to learn about Abu Dhabi’s history and traditions. Stroll the manicured waterfront of the Corniche, marvel at the skyline from Observation Deck at 300, and don’t forget to do some shopping at Abu Dhabi Mall or Al Wahda Mall. The city is also a good base for many daytrips, among them Al Ain Oasis and Camel Market, neighbouring Dubai, and the Arabian Wildlife Park on Yas Island. If you are looking for the ultimate luxury experience, you have come to the right place. 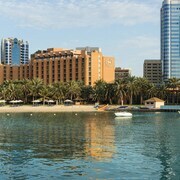 Hotels in Abu Dhabi offer the best of everything and whether you stay at an airport hotel or an island resort, you will get spoiled like you have never been before. You can find accommodation in many places of the city but popular choices include Abu Dhabi City, Corniche, and Yas and Saadiyat Island. Abu Dhabi International Airport (AUH) is of course the closest airport, but Dubai International Airport (DXB) is only 150 km to the East. The green and white A1 buses are a comfortable and cheap link between Abu Dhabi Airport and the city. You can also catch a taxi or rent a car to get around. If you are flying with Etihad Airways, luxury coaches and a chauffeur service are available. 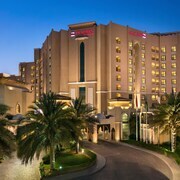 Abu Dhabi accommodation is generally not cheap. Prices vary considerably, depending on dates, and we at Expedia.co.in strive to get you the best rates for top Abu Dhabi hotels. 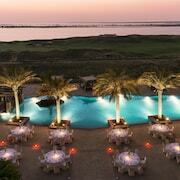 Browse our selection of amazing hotels and resorts and book your stay in Abu Dhabi today. You can also save hundreds by booking holiday packages containing flights and hotel.